French oil and energy group Total said on Monday it had made a major gas discovery on the Glendronach prospect, located off the coast of the Shetland islands in the North Sea. 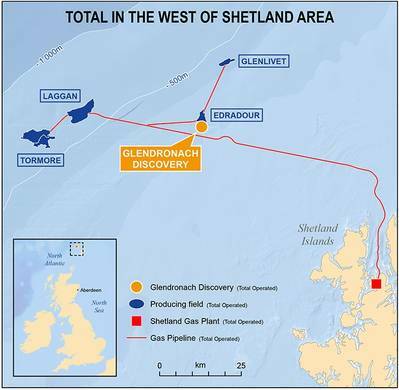 "Glendronach is a significant discovery for Total which gives us access to additional gas resources in one of our core areas and validates our exploration strategy," Arnaud Breuillac, President of Total's Exploration & Production division, said in a statement. Wood Mackenzie North Sea research analyst Kevin Swann said it was the largest conventional discovery in the United Kingdom since Culzean in 2008, and it could contribute as much as 10 percent of the UK's annual gas production in its early years. "Exploration in the UK has been a huge concern so far in 2018 with just five exploration wells spudded to date – on track for lowest levels of activity since the 1960s. So this discovery is welcome news," Swann said in a statement. He said that although the West of Shetland region was under-explored, it was core for oil majors BP, Shell , Total and Chevron, and large development projects were expected to boost production from it through to the mid-2020s.